Moose Madness Series and ‘Quick-Fix’ For the Hunter Combo — Temporally Unavailable! 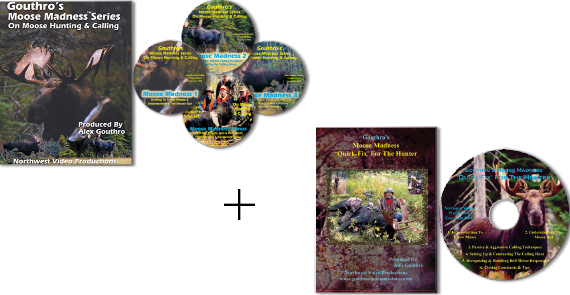 Pairing the Gouthro’s Moose Madness Series On Moose Hunting & Calling with the Gouthro’s Moose Madness ‘Quick-Fix’ For The Hunter gives the hunter/caller the best of both worlds. 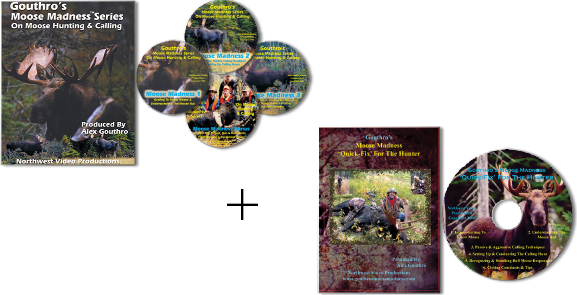 This is an unbeatable deal in gaining moose hunting & calling knowledge and instruction, backed with award winning video footage. While the ‘Quick-Fix’ Chapters cover all the essentials very well, the following topics covered in the Moose Madness Series are not covered in this ‘Quick-Fix’ production: 1. Moose Identification; 2. Moose Habitat; 3. Moose Survival; 4. Moose Anatomy & Shot Placement; 5. Use Of Decoys; 6. Meet The Players; 7. Alternative Method Of Field Dressing; and 8. Equipment Considerations. Where the Moose Madness ‘Quick-Fix’ shines is in its shorter length giving the hunter the opportunity to quickly review the essentials before each hunt. And yes! You get to see different moose action in both productions. Applicable HST or GST sales taxes will apply to any purchases made from Canadian Provinces & Territories. A $6.00 flat rate for shipping & handling will apply to all purchases. 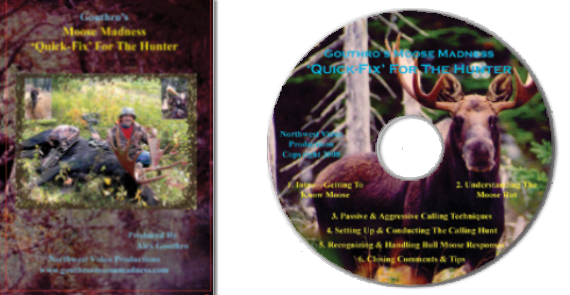 Welcome to Moose Madness Productions > Products > Uncategorized > Moose Madness Series and ‘Quick-Fix’ For the Hunter Combo — Temporally Unavailable!